Giancarlo Fisichella signed Renault F1 Photo - BIG ! << Back Giancarlo Fisichella signed Renault F1 Photo - BIG ! Giancarlo Fisichella signed Renault F1 Photo. 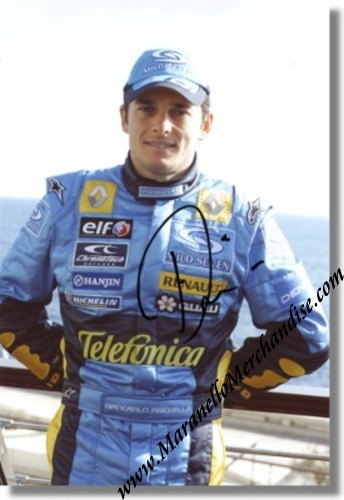 This is a HUGE portrait photo of "Fisico" in his Renault F1 outfit. Giancarlo personally signed this photo with a black marker. The photo measures approximately 20 x 30 cm or 8 x 12 inches. This is a very rare opportunity to own a great item signed by one of the worlds most sympathetic racing drivers and items like this will surely appreciate in value.